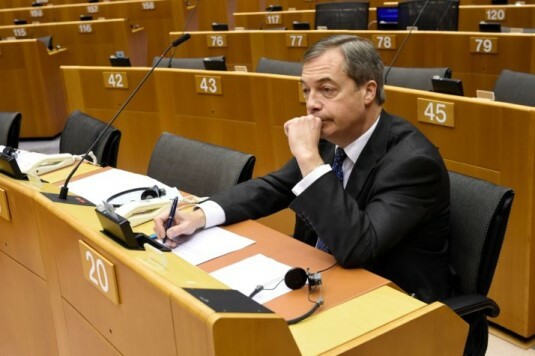 With Nigel Farage’s resignation, the stake has finally been driven through the blackened, wizened heart of the United Kingdom Independence Party. The head remains to be cut off and the rest cast into the flames, but for all intents and purposes the party is dead – just as the chances of a revival are coming into play again. The rise and fall of UKIP is a tale of bigotry, careerism, opportunism and incompetence. And above all its short history condenses on a smaller and accelerated scale the essential ingredients of the long-term decline and crisis of the Conservatives. Let's recap. For our purposes, there have, if you like, been two waves of UKIP. The first was in 2004 when the unlamented Robert Kilroy-Silk capitalised on a few anti-Arab racist articles he had written for the Express (then, as now, the Mail's desperate, try-hard mini-me) by joining UKIP and creating a media buzz around the party for the first time. And the second marked the party's move into the mainstream off UKIP's capitalisation of the difficulties the Tories had over getting equal marriage through the Commons. Long time readers and politics watchers will remember this was a central plank of Dave's social liberal strategy, caused great upset among the blue rinsed bigots in the associations and encouraged experienced (and irreplaceable) activists to defect to UKIP. The purple party, smelling the opportunity for new recruits, dumped its previous formal commitment to libertarian values and came out in defence of "tradition" - a process that involved Farage pretty much dumping the kippers' youth section. Still, it was a price worth paying. UKIP surged from nowhere to coming within a whisker of taking a seat from the LibDems at the March 2013 Eastleigh by-election and catapulted them into the big time. Farage became a household name, he was never off the telly, and at every by-election between early 2013 and the 2015 general election the kippers consolidated their position as the go-to protest vote, regardless of who held the seat. They were able to bag a couple of Tory MPs - Douglas Carswell and Mark Reckless - who both resigned their Tory membership and forced by-elections they subsequently won on a kipper ticket. And, famously, it was the growth in support that frightened Dave into conceding a referendum on EU membership. We know what happened next. From the outset, even when UKIP was on the rise it had two big problems. It was a highly unstable political formation full of racists and Walter Mitty chancers, and it was born in decline. This might seem a bizarre claim considering there was a point when membership and votes surged, but not when you consider the human stuff from which the party was fashioned. On plenty of occasions we've talked about the Tory party's declining voter coalition, composed mostly of older voters (particularly retirees) and people in occupations that are on the way out. This wouldn't be a problem per se if these groups were replaced by other voters as they aged, but the conservatising effects of age are breaking down and Tory values are at odds with the culturally dominant social liberalism of younger voters. The rising generation therefore are not necessarily leftists, but they're not going to vote Tory either. UKIP's take off was part of a reactionary backlash against Dave's efforts to push the Tories through a superficial make over. Therefore not only did the party capture older and mainly (white) male activists, they did so on the basis of backward politics completely out of step with the mainstream. Stability could only be bought at the expense of the Tories, despite the stupid commentator hype that claimed UKIP posed Labour an existential crisis. In other words, from the off UKIP was plagued by a crisis of long-term viability. And so as long as Europe remained an issue for its band of obsessives, for as long as the tabloids did the cheer leading for UKIP's immigration policy, and for as long as the kippers were able to present themselves as a bunch of white imperial Britain nostalgics, they could corner a section of the electoral market. Well, the referendum came, and the result ostensibly carried UKIP's raison d'etre away with it. Labour delivered them a a body blow in Stoke-on-Trent Central, but the writing was on the wall after May moved quickly to position herself as the custodian and guarantor of hard Brexit. Her authoritarian, anti-immigration project won back the bulk of those who had defected under Dave in terms of polling and at the 2017 general election. In these straitened circumstances and with Farage retiring to spend more time finessing his bank balance, there were two ways of keeping the ship afloat. There was the Paul Nuttall strategy of positioning UKIP as the keepers of the Brexit flame, or of lurching even further to the right. Nuttall was partly correct in his diagnosis, but believed the kipper interest was best served going after disaffected Labour voters. Doh! As we have seen, there has been a little bit of slippage away from the Tories toward the purples since May unveiled her Brexit deal. The other, piloted by the faintly ridiculous Gerard Batten, is to flirt with the fash and double down on Islamophobia and cartoon conservatism. This is hardly the path back to the big time, but as the 00s showed there was a small but persistent voter population prepared to give the BNP their votes on such a basis. The problem for Batten is this soft fash turn is toxic to most voters, including not a few Tories. And, of course, it has proved enough to spark Farage's resignation. As you might expect, various folks have gone to town on Farage’s announcement. He said the employment of Stephen Yaxley-Lennon as an advisor to Batten was the final straw. The overt racism of this pathetic petit-bourgeois thug was too much to stomach, he claimed. Well Nige, it’s a good job there is this thing called memory because, along with Theresa May, there are few politicians active in British politics who’ve done more to stir up antipathy toward immigration generally and Muslims in particular than your precious self. Where Yaxley-Lennon prefers the intimidating power of the beered up crowd, Farage exploited fear and encouraged hostility off the back of multiple media appearances and racist billboard posters. No, it’s less the political message of Yaxley-Lennon’s street movement Farage wants to distance himself from and more its crudity and violent revelry. While UKIP’s leader and best known figure, his outsider poise remained just about within the boundaries of official political debate. Establishment anti-establishmentism opens lucrative doors, like the very well paid berth at LBC for example. As far as Farage is concerned, UKIP was a vehicle that transported him, for a time, into the front rank of British politics. He did very well out of it, but now the EDL association and overt racism is, well, embarrassing. When the MEP salary and expenses disappears he's much more marketable without the baggage of pissed up footy hooligans getting dragged from studio to studio. UKIP lived by Farage, and has died by his hand. There are a few death rattles and spasms of rigor left in the kipper corpse and, for now, Farage is happy to draw his salary and rant from the warmth of his studio. But while UKIP is dead, Farage is not, and the possibility he could affect a return some point down the line cannot be ruled out. Perhaps not so much that the conservatising effects of aging are breaking down as that the Conservative Party is less conservative. What have they done for their core constituency in the small buisness sector? Have they created a level playing field with big buisness on tax or the burden of paperwork relating to regulation? Anarchists don’t have a monopoly on libertarianism, there are plenty of others, including pro-capitalist forms, that has been about for a very long time. Always refreshing to see a fellow anarchist in these parts. It gets kind of lonely at times. Technically, this is correct. There are libertarian currents within Marxism (e.g. council communism) that, strictly speaking, are distinct from anarchism, even though they, broadly speaking, share the same ends and means. The use of the term 'libertarian' to refer to anti-statist socialists has a far, far longer pedigree than the meaning of the word that has become fashionable in the Anglo-Saxon world (advocates of laissez-faire capitalism), the latter being the result of the co-optation of the term 'libertarian' by people like Rothbard in the US during the postwar period. Pro-capitalist 'libertarians' aren't libertarians in any historical sense of the word. I prefer Murray Bookchin's term for them - proprietarians. Their notion of 'liberty' would mean liberty for the owners and proprietors of the means of production, and particularly those who own and control a lot of means of production, at the expense of everyone else. I refer you to my response to the second Anonymous, and in particular to what I said about the history of the term 'libertarianism'.